JEGS Steel Battery Trays are vinyl coated to resist rust and corrosion. Available individually or in a set with a vinyl coated hold down and (2) 3/8" x 10" plated j-bolts. JEGS HDPP (high density polypropylene) Battery Trays offer a lightweight yet soild way to remove weight from the vehicle. Features approximately 1/3 the weight of a standard steel tray as well as being rust and corrosion resistant. Available individually or in a set with the hold down and (2) plated 1/4" x 10" J-bolts. JEGS brightly polished, stainless steel battery tray is the perfect place for your new battery. Ideal for street rod's or show cars. Made to resist rust and corrosion, this tray measures 7'' x 13'' and will fit group 24, 27 and 74 batteries. 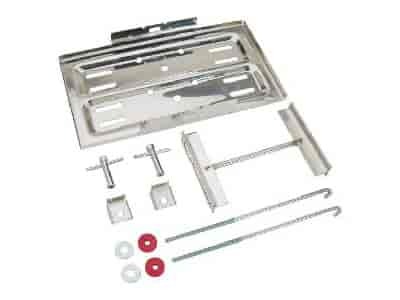 Includes a stainless steel H-Type bracket, hold down studs, chrome hex head T-bar hold down fasteners and insulating rubber bushings with washers. Note: Not NHRA legal. 10265 is rated 2.9 out of 5 by 7. Rated 5 out of 5 by AnotherMoparMan from Excellent quality Bought 3 battery trays for my bass boat. Stainless steel was the only way to go. Battery trays were far superior than the cheap plastic junk marine outlets offer. Eliminated all movement. Rated 4 out of 5 by LeoB from NICE!!! Good product for the price! No instructions, but reasonably simple to set up. My only complain (therefore withholding the 5th star) is that the hold down rods are not stainless....really! Otherwise simple and likely durable battery tray. Rated 3 out of 5 by Jerry45 from It's a nice looking battery holder except for the hold down rods or the top bracket. That design leaves a lot to be desired. The only way I would use this is, it's hidden in the trunk of the car. Rated 2 out of 5 by Drift from Measurements are off It works well with modifications but i bought it because i had a tight place for it to fit in but the tray is about 3/4 inch longer in lenth and width than stated so make sure u have wiggle room. Had to cut and weld some parts because i didnt have time to return it and get a different size. Rated 1 out of 5 by hello my friend from no easy to attach top portion no instructions therefore not easy to understand how to securely attach the top portion to the threaded rods. Yes, this battery tray will hold the series 31 AGM battery.